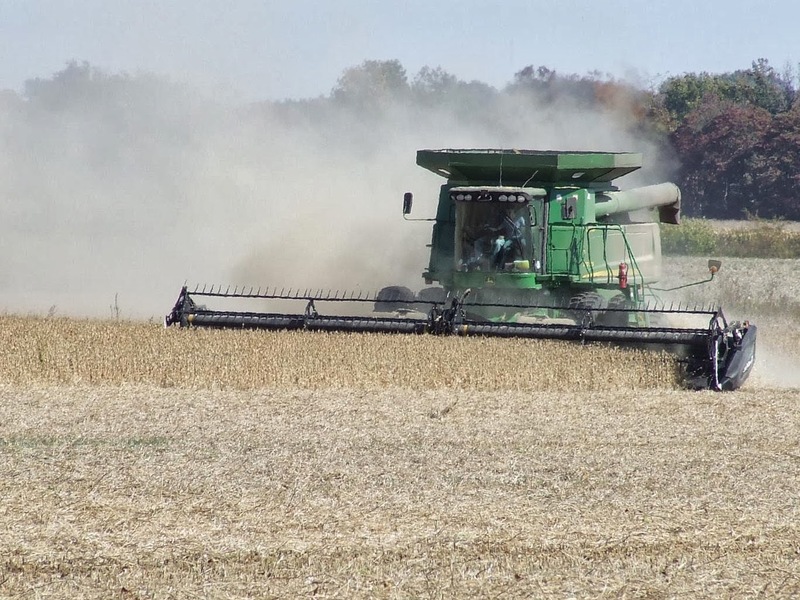 This is my husband in the combine, cutting soybeans. I've been a farmer’s wife for thirteen years. In that time I have learned a thing or two about harvesting grain, mostly thanks to him. In the spring, the soil must be dry enough to not get the tractor stuck. It must be warm enough. It must be correctly pH balanced for the crop you’re planting. It needs fertilizer specific to your crop and soil, at the proper time, under proper conditions. It needs plenty of rain, but too much rain too fast and the ground crusts over and soybeans “break their necks” trying to emerge. In the summer you need weed control, pest control, more rain, lots of sun, and temperatures neither too hot nor too cold. In the fall you again need the soil to be dry enough. The crop itself must have a low percentage of moisture. But, wait too long and the bean pods will pop open and you lose the crop. No year is like another. Conditions are never perfect—heavy rain, sun, wind, extreme temperature, disease, pests, fertilizer washed away, even weeds, are factors beyond our control. All in all, it’s nothing short of miraculous that we ever have any crop to harvest, and yet year after year, God is faithful to provide even in the worst conditions. It’s like that with His Word, too. No matter how badly I do at sowing Jesus into someone’s life, how much rain I deluge on my good example, when I’m more of a pest than a friend, and even when I am salt and light in havoc-wreaking proportions, God can still provide a good crop. The mess I make of His field, and peoples' hearts, is not beyond His redemption. His Word goes out and does not come back without accomplishing what He desires (Isaiah 55:11).